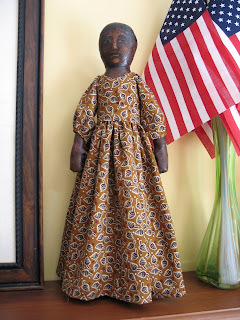 I was looking for pictures of another doll that would be appropriate for 4th of July and found this one with the flag in the background. I made this last summer about this time. This was the first doll I did where "Dixie-ness" started coming through. Up til then I had been doing other people's patterns somewhat faithfully. Or making what I thought others wanted. This was the first doll that I made that was just to experiment and please myself. She was a doll that I hated so I gessoed over her and did an underpainting with umbers and siennas and then crackled over the whole thing and then added more layers of glazing. There were so many layers of stuff on the doll - the crackle actually cracked. Well, anyway - the purpose of this picture is to wish everyone a safe and happy 4th of July! I'm off to the lake! And as a premium - do you ever send e-mails like this to family members? "If you're wondering where your cell phone is it was washed with the last load of laundry along with the Listerine strips." you made me giggle with the cell phone quote. Love the doll; be blessed this celelbration of liberty! OMG Dixie. She is my kind of gal! I LOVE LOVE LOVE HER! You should definately be "You" more often!!!! She's dreamy! I think she is my all time favorite doll that you have made! !